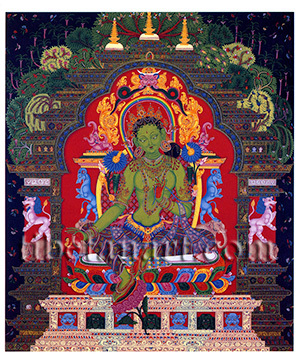 This painting of Green Tara is a copy of a famous early Newar or Eastern Indian thangka that is now housed in the Cleveland Museum, which has been dated to around 1260. This painting was once attributed to a brilliant thirteenth century Newar artist named Arniko, who was reputedly appointed master artist to the Chinese court of Kublai Khan when he was only eighteen years of age. Green Tara sits in her familiar posture of royal-ease upon a white moon-disc and a multicoloured double-lotus that rests upon an ornate throne, with her extended right foot resting upon a small lotus pedestal. The steps of this throne are decorated with scrolling designs, lotuses, petals and jewels, and its main upper step with roundels that contain small images of swans and deer. The main façade of her throne is supported by eight ornamental pillars, which enshrine the heads of three elephants and four blue lions. The 'six-ornamented' backrest of her throne is supported by two elephants with a mythical blue creature known as a sharabha standing upon the back of each elephant. The horns of the sharabhas support an ornate crossbeam upon which crouch two ferocious makaras or 'crocodiles' with long scrolling yellow tails, and at the top centre is the serpent-devouring head of kirtimukha. Green Tara is depicted with large breast and a sweetly smiling face, and she wears lower garments of embroidered silks, a diaphanous scarf, and all manner of golden, jewelled and pearl ornaments. With her right hand she makes the abhaya-mudra of protection, with a devotee kneeling in adoration beneath her open palm. And with her left hand she holds the stem of a blue utpala lotus in front of her heart. Her halo appears as a ring of rainbow light, and her aura as the red interior of an arched gateway or torana. The two narrow vertical pillars of this torana each display four images of Green Tara in her role as the protector from the 'eight great fears', which are: fear of thieves (false views); snakes (jealousy); fire (anger); lions (pride); elephants (ignorance); drowning (attachment); demons (doubt), and imprisonment (greed). On the outer sides of these pillars are the gaja-simha symbols of a rearing lion standing on the back of an elephant, which serve as guardians for the multi-levelled temple complex within which Tara is enshrined. The horizontal steps, plinths and facades of this structure are fashioned from all manner of precious materials. Above the arch of her torana is a small image of green Amoghasiddhi Buddha, the 'Lord of the Karma Family' to which Tara belongs, and lower down on her torana's right and left sides are the small images of Prajnaparamita with her attendants, and Avalokiteshvara with his attendants. Collectively these three small figures represent the 'Three Jewels' of the Buddha, Dharma and Sangha. Three white stupas, each with seven golden parasol wheels and finials, crown the top of her temple, and behind its upper structure are many different varieties of palm-trees, with fragrant flowers raining down from the heavenly sky above.